How do you stage a successful play? Where does it all begin? Who does what? On this DVD, Adrea Gibbs explains the role of everyone in a production: the director, the stage manager, the music director, the choreographer, the lighting designer, the sound designer, the set designer, and the costume designer. 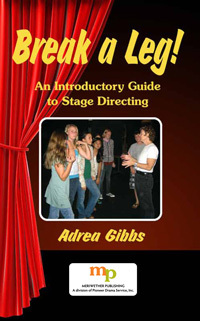 Gibbs also elaborates on almost all the aspects involved in a show from auditions to opening night: the best way to conduct auditions and how to do the final casting; how to decide the main thrust of the play, which will affect the work of everyone on the staff; the basics of stage sets and blocking; how to direct the actor to create a believable character; scheduling rehearsals; and being ready in every way for opening night. Read more...This DVD is so comprehensive that you will want everyone on your proudction team to view it so that each person will understand how their role fits into the total production.